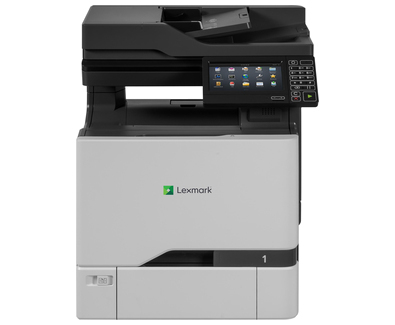 Lexmarkâ€™s CX727de is a very fast colour MFP that prints up to 47 ppm and scans up to 56 sides or images per minute. A 1.2GHz quad core processor with up to 4GB of memory gives the CX727de fast and powerful print capabilities. Professional colour features including ultra-sharp 4800 Colour Quality, PANTONEÂ® calibration and Lexmark Colour Replacement work with Unison Toner to deliver precision matching for critical colours. Lexmarkâ€™s Embedded Solutions Framework applications let you run software solutions to meet the needs of your industry. A bright, 17.8 cm e-Task colour touch screen features an ultra-smooth surface and can be activated by almost anything, including pens, fingertips or nails--without pressure or direct skin contact.